Ards may be struggling at the foot of the table but Sky Blues boss David Jeffrey expects a tough test against them on Tuesday night when they meet in the quarter-finals of the NIFL League Cup. “We played Ards in Bangor in August and they were by far the superior team in the first half,” said Jeffrey. “A better second half saw us eventually triumph on the day but if they had taken their chances we probably wouldn’t have won. “We won the competition in my first full season at Ballymena and got to the final last season. “However, we didn’t perform against Dungannon in the decider and we would like to get back there and make up for that disappointment. Meanwhile, Crusaders boss Stephen Baxter says keeping Glentoran strikers Curtis Allen and Robbie McDaid quiet is key to winning the League Cup quarter-final at the Oval on Tuesday night. “Curtis Allen and Robbie McDaid are very lively in attack so you have to be aware of their threat,” Baxter said. 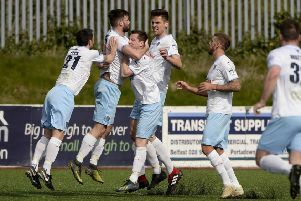 Premiership champions Crusaders beat their East Belfast rivals 3-0 at Seaview in their first meeting of the season last month. Baxter’s men have won their last two matches to move into the title picture while the Glens have slipped down the standings after five defeats in their last six league games. Glentoran’s latest loss came at the hands of in-form Ballymena, who won 1-0 on Saturday to remain third in the standings. The other quarter-finals see Cliftonville entertain holders Dungannon Swifts on November 20 and Linfield are away to Championship side Portadown on December 4.